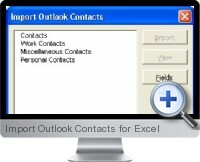 Import Outlook Contacts for Excel (EE Import Contacts) is a Microsoft Excel add-in that allows users to import Outlook contact folders directly into Excel. From user forms, users can determine which fields are imported and can also edit the Outlook contacts prior to import. Import Outlook Contacts for Excel saves time by allowing to avoid the cumbersome, multi-step process of exporting from Outlook and then importing into Excel.